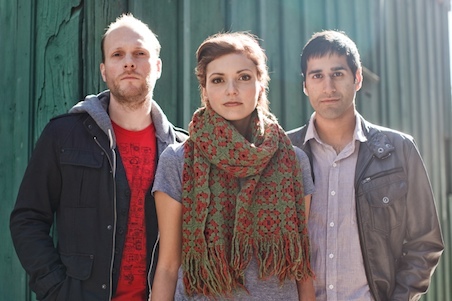 The Rural Alberta Advantage was one of my favorite new bands that I discovered in 2009 with their album "Hometowns". This album was originally released in 2008 then re-released via Saddle Creek Records in 2009. The 3-piece band are from Toronto, Canada and have drawn comparisons to Arcade Fire's revved up instrumental sounds and the voice of Neutral Milk Hotel, Jeff Mangum. The RAA received a lot of noteworthy buzz in 2009 by playing at SXSW on the same bill with Grizzly Bear then a sold out tour and signing to Saddle Creek with lots of media attention. Their sophomore album 'Departing' will be released March 1 via Saddle Creek and Paper Bag in Canada. In conjunction with the new release they start playing Canadian cities tomorrow, NYC in January, and a pretty full US tour month in March with a stop at SXSW. The first sneak peak we get from the new album is track #6 "Stamp", a free download you can get here by entering your email address. This song has a lot of charged up characteristics reminiscent from the first album and I'm crossing my fingers that it's as great as "Hometowns". I have lots of fond memories dancing with my besties to that album!